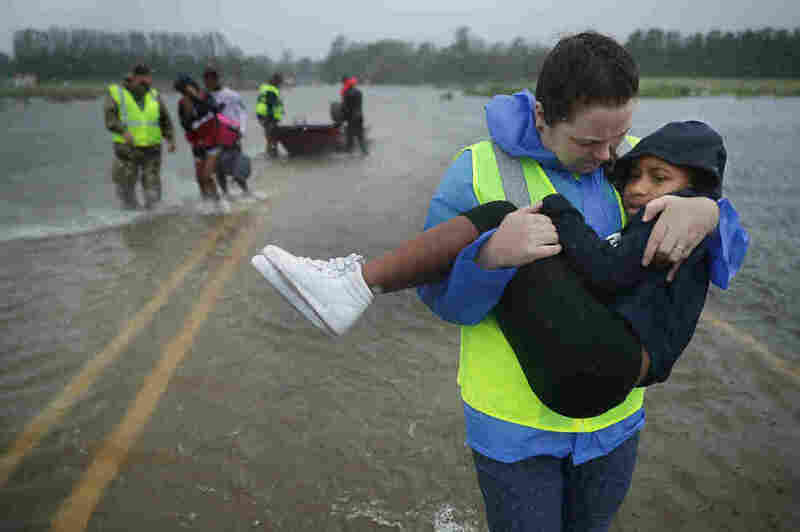 In New Bern, N.C., More Than 100 Await Rescue From Florence There are five swift water rescue teams working the area, assisted by the Cajun Navy volunteer rescue group. More Than 100 Await Rescue In New Bern, N.C.
Michael Nelson floats in a boat made from a metal tub and fishing floats after the Neuse River went over its banks and started to flood his street in New Bern, N.C., on Thursday. 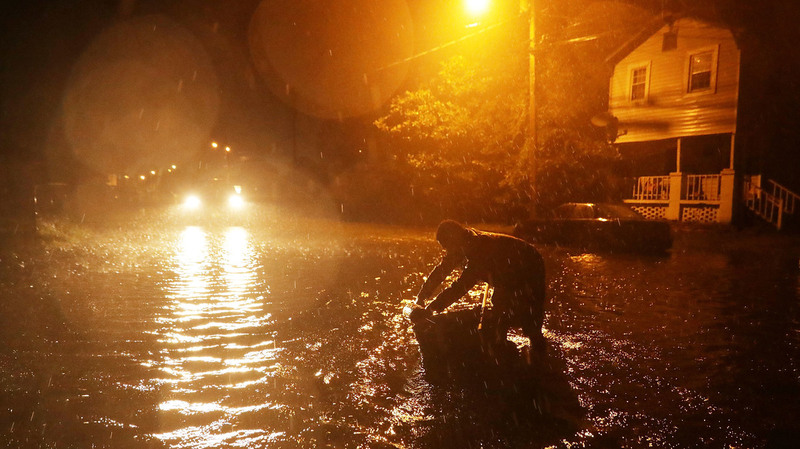 More than 100 people were waiting to be rescued from homes and vehicles Friday morning in New Bern, N.C., after Hurricane Florence brought severe flooding to the area. Officials say more than 100 people have already been rescued in the area overnight. Six swift water rescue teams have been working since Thursday afternoon to evacuate individuals and families, in some cases, from the roofs of their homes, the New Bern Public Information Officer Colleen Roberts said Friday afternoon. "Just dozens of calls just saying, 'the water is coming in the house, the water is now over the hood of my car. I'm in chest deep water, I need help, I need you to rescue me," she says. "Because we had gotten to a point where the weather was so bad, we were having to stack and strategize on those calls. We were forced to have conversations with these people and say hey, do you by chance live in a two-story home? Can you go up a level? It may be a while before we can get to you." On Friday afternoon, Bern Mayor Dana Outlaw explained to NPR's All Things Considered that people stayed in their homes, despite evacuation orders, because storms that were predicted to be terrible in the past, just didn't happen. "This time it did," he said. "Unfortunately, this is kind of a wake-up call that these things do happen. We see it happen in New Orleans and other areas. You have somewhat of a culture that it won't happen in New Bern and it has happened in New Bern." Rescuers are assisted by the Cajun Navy volunteer rescue group, Gene Hodges, assistant county manager with Craven County government, told NPR's Brakkton Booker. "We're working as hard as we can," Hodges says. Volunteer Amber Hersel from the Civilian Crisis Response Team helps rescue Keiyana Cromartie, 7, and her family from their flooded home on Friday in James City, N.C., near New Bern. "Help is on the way," said Mayor Outlaw. "As expeditiously as we can with the weather conditions, the wind conditions, we've gotten water-rescue teams together to go out and rescue residents." Craven County Emergency Services has reported impassible roads due to flooding; downed power lines; and trees on cars. New Bern, a city of about 30,000 residents, has been under a mandatory evacuation order since Tuesday. Sarah Risty-Davis, who was born and raised in New Bern, told NPR's Morning Edition that she saw high floodwaters until the early morning but that the water has mostly receded in her neighborhood. She plans to continue to ride out the storm. If the water starts to rise again, she says, she'll head upstairs and wait for it to recede again. 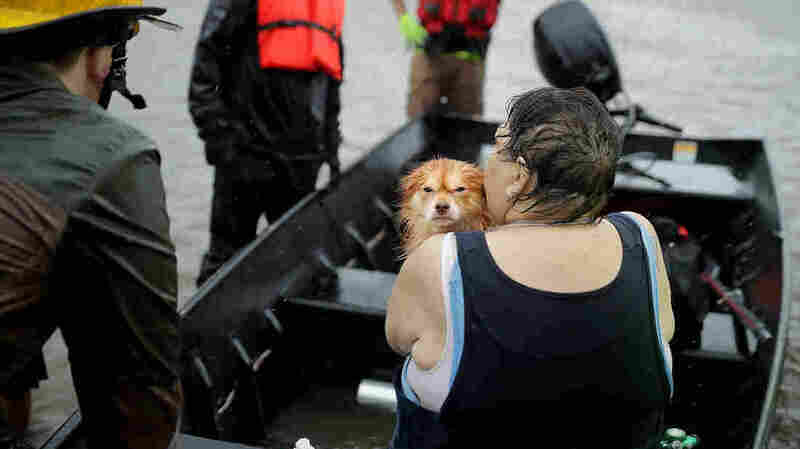 Rescue workers and volunteers help a woman and her dog leave their flooded home during Hurricane Florence Friday in James City, N.C., near New Bern. Gov. Cooper told Morning Edition that he expects flooding could get worse as more rain falls and that the state's No. 1 mission right now is "working very hard to save lives." Officials are advising people who are stranded to move up to their attics or other high ground if possible. Craven County public information officer Amber Parker says the storm surge has caused flooding in some downtown New Bern businesses, and Union Park is underwater. Water also rushed into the county's emergency operations center. "We have an old jail building, and there was a sally port where vehicles could drive down into it," she says. "And it's basically a big hole and water did go into that hole, but we are safe in this facility." The area is also experiencing some power outages. "You never know where there are active downed power lines that could cause an electric situation," Parker says. "We just want people to be very careful." Parker says water levels in some areas of Craven County are already higher than levels from Hurricane Irene. Hodges expects the rescue operation will be "going on for quite a while." Roberts says they're hearing from New Bern residents who were evacuated to an emergency shelter in Sandford earlier this week. "They're already calling and asking when they can come back. We need to get some order in place around here. The streets are a disaster. "